The 9th Wonder of the World! To say that the Tornador gun has taken the world of professional detailing by storm and rightly so! This tool is an absolute game changer when it comes to what seems like endless uses of cleaning. I first caught wind of the Tornador cleaning gun from watching a video on YouTube and was instantly mesmerized at its performance to clean carpeting and car upholstery of every kind. Cleaning the endless types of fabrics contained within the cars of today's moderns cars and the modern fabrics used to build these cars is an intimidating task for even seasoned detailing veterans like myself. Read along and see if you are not convinced at the merits of this amazing new tool of the auto appearance industry. "There is not an industry in the world that has not been profoundly impacted with advances in modern technology; the Tornador cleaning gun is just that for the professional world of detailing"
What is the Tornador Gun? A highly effective tool used to clean virtually any surface or any material found within or without on a car for the detailing process. How does it work: Compressed air is fed through a fine tip that oscillates at a high RPM (revolutions per minute) rate contained within a coned nozzle. With its high quality plastic bottle attachment, it can also allow water or other chemicals to be introduced into the air stream for additional cleaning capabilities. The high speed and pressure of the compressed air breaks up dirt and debris allowing for quicker, easier, and more effective cleaning. 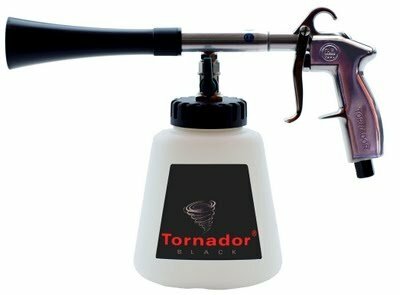 Use the secure Amazon link below to get your Tornador Gun and take your detailing efforts to the next level! Over-delivering to your customers will be that much easier. Your life as a detailer will be that much easier. Cleaning stubborn stains and dirt from any form of fabrics will seem like a cake walk compared to your old ways. Ideal for use on those difficult "sport" materials used in many entry level cars. Ideal for heavily soiled floor mats. Endless possibilities only limited by your imagination. "Darren, what is the best air compressor to use with the Tornador cleaning gun?" The winning combination of size and power requirements. I chose the horizontal model so it would fit inside my van. If you have the budget and room for a bigger compressor it would be nice, but certainly not necessary. I chose a Craftsman at first, but was very disappointed in the build quality that became very clear upon simple assembly requirements. I went with the DeWalt as I have always been very pleased with the DeWalt tools I have and continue to use. You can use a smaller compressor so long as it meets the minimum operating requirements, but the trade-off will be your compressor running out of air very quickly and will have to cycle on and off very frequently. If you are working on a budget and trying to establish your professional detailing business on a shoe-string budget, then this tool is not likely to make it one your list of must haves. After all, I was able to make it without this tool for the past 25 years professionally; me and every other detailer in the world! But if you do have the budget and you are looking to deliver serious professional grade results, especially when it comes to cleaning fabric car upholstery of every kind, then this might be a must have. At this point you should have more than enough information to make an informed decision as to whether the Tornador cleaning gun is right for you and your world. You can help me by paying it forward and sharing this information to your favorite social media site and let others learn from the information I have spent much time compiling.